The deep convection over the nw Caribbean sea has become better organzied and a tropical depression may exist. The low is drifting west over the Yucatan Peninsula which will stop development for the time being. Regardless if this feature is named or not heavy raiinfall can be expected over the Yucatan Peninsua. 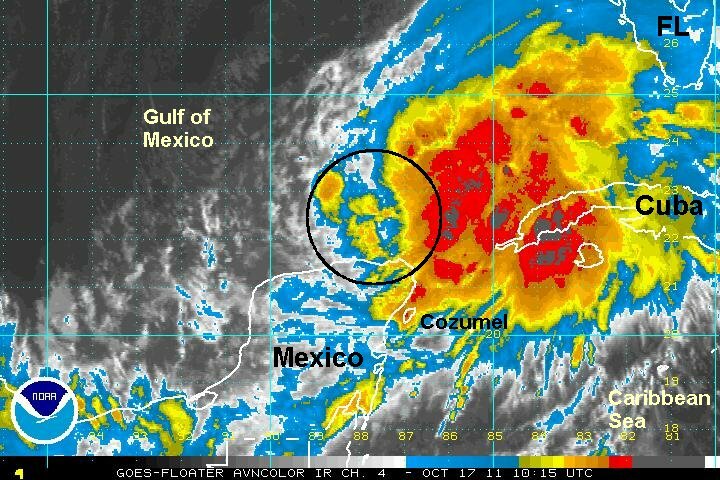 At 9 am edt / ast the tropical disturbance was centered near 20.0 N / 87.0 W or just south of Cozumel, Mexico. Top sustained winds are estimated at 35 mph. Movement: west 10 mph. Pressure estimated at 1004 mb. Forecasts drift this tropical disturbance west over the Yucatan peninsula briefly into the Bay of Campeche then back over the Yucatan during the next several days. 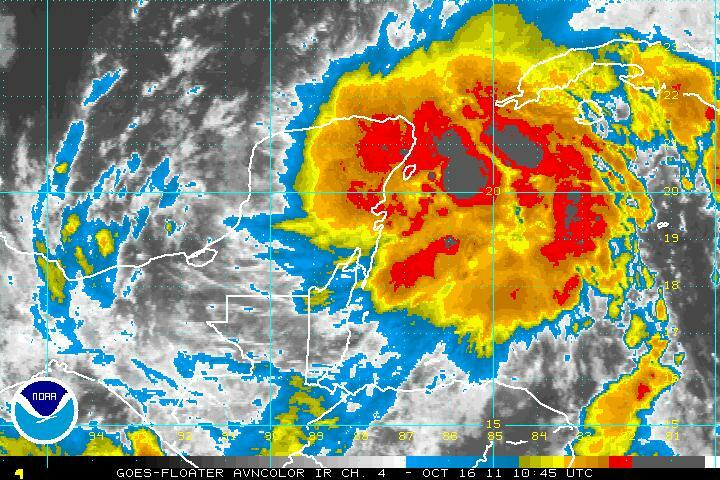 It appears (still) that a tropical depression has formed north of the Yucatan. Winds are nearly tropical storm force in the Yucatan Channel. Deep convection with heavy showers and storms are mostly east of the low center into the Florida Keys / southwest coast. At 8 am edt / ast the tropical disturbance was centered near 22.5 N / 88.3 W or about 480 miles southwest of Ft. Myers, Florida. Top sustained winds are estimated at 35 mph. Movement: nearly stationary. Pressure estimated at 1002 mb. Forecasts drift this tropical disturbance northeast toward the west coast of Florida during the next 1-2 days. Wind shear will pick up, but it is possible that this could be classified as a storm before shearing effects take place. The low pressure center is difficult to locate. It is west of the deep convection. Because of this, it will be difficult for any further strengthening. Despite this fact, heavy rainfall continues on the southwest coast of Florida. Doppler radar estimates that over 15" of rain has fallen near the western Keys. Key West reported 7" over the last 24 hours. More modest amounts of 1-3" has fallen over the western Everglades. Rainfall will spread northward over the peninsula later today and tonight. At 7 am edt / ast the tropical disturbance was centered near 24.0 N / 88.0 W or 440 about miles southwest of Tampa, Florida. Top sustained winds are estimated at 35 mph. Movement: ne 15 mph. Pressure estimated at 1004 mb. Forecasts take the tropical disturbance into the west coast of Florida north of Tampa tonight. 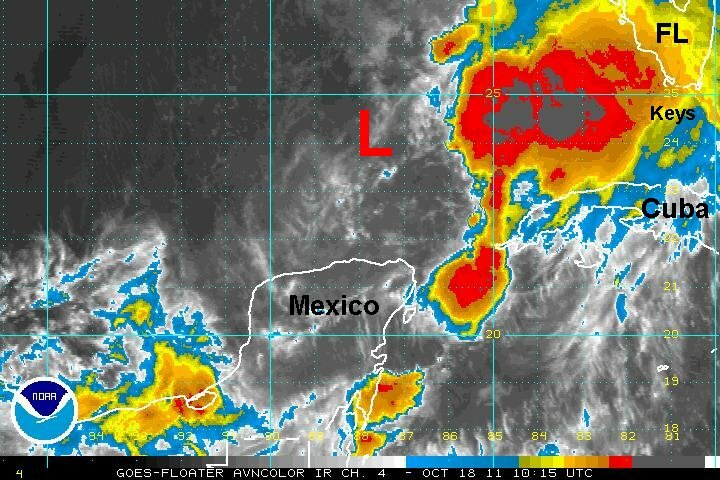 The tropical disturbance was sheared badly yesterday as the low level vortex was left behind a little north of the Yucatan peninsula. Despite this, heavy rain has continued over parts of Florida. Key west reported over 2" and doppler radar has estimated considerably more offshore. Estimates of 10" were offshore of Naples and 6" to the north. Heavy rain will continue today in parts of south Florida, especially the Keys into parts of the northwestern Bahamas.